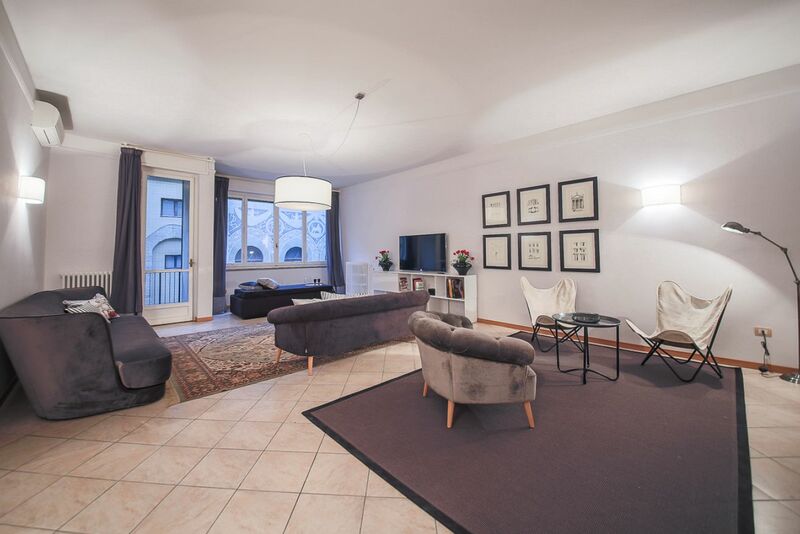 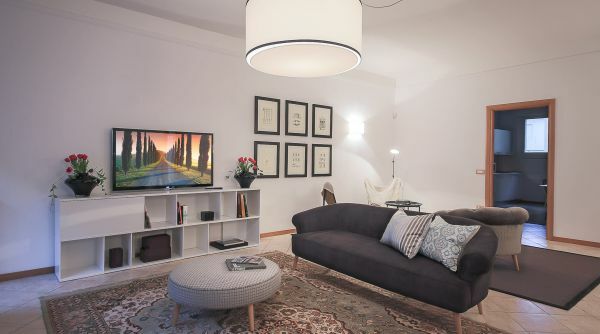 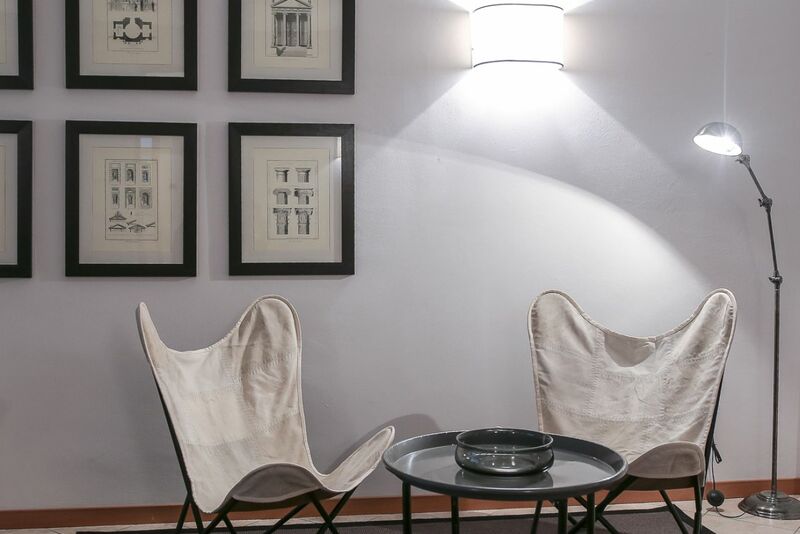 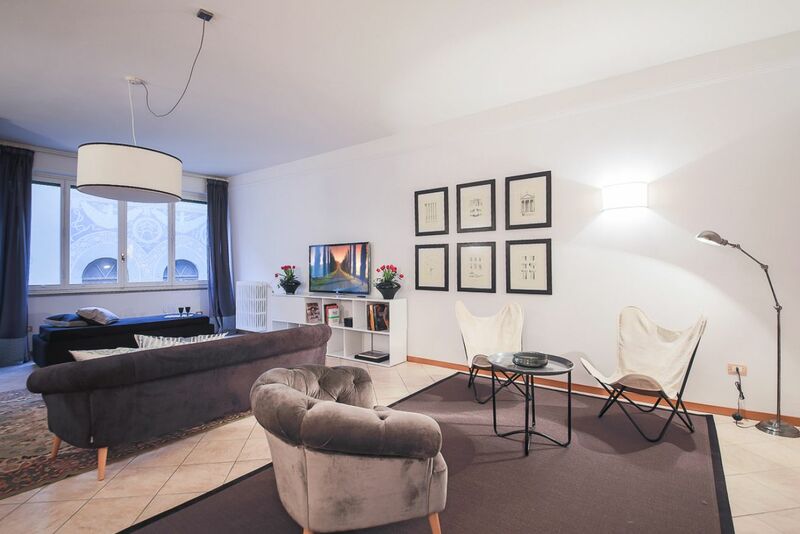 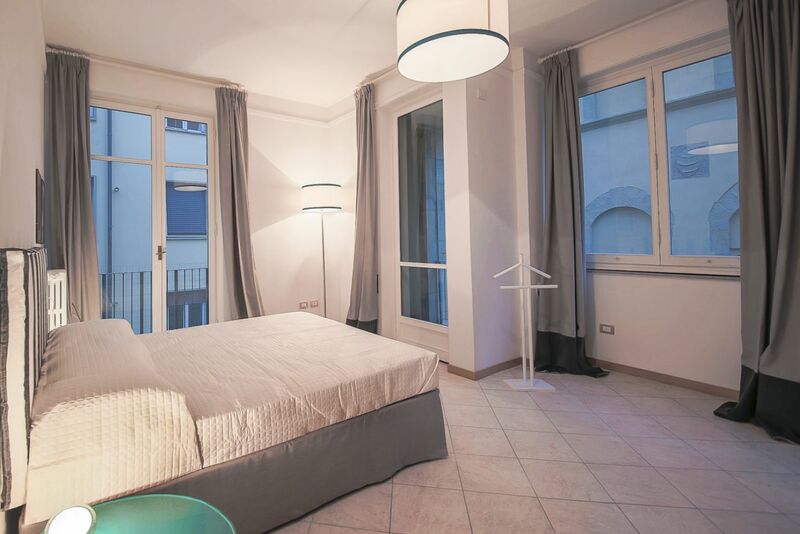 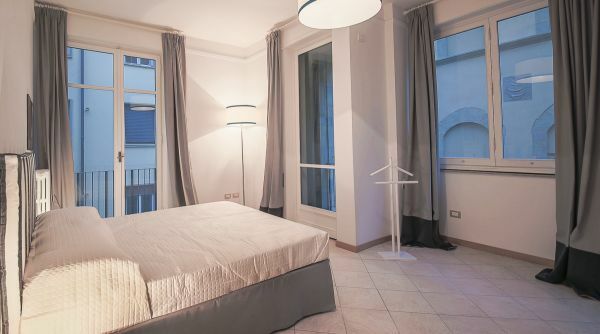 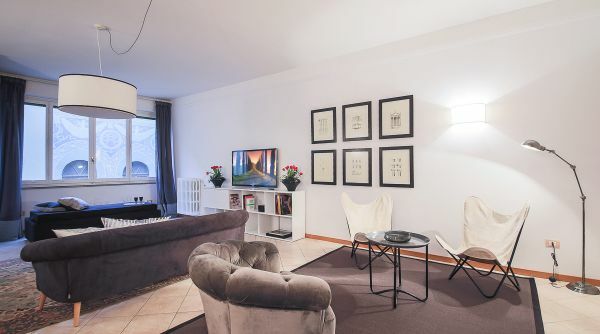 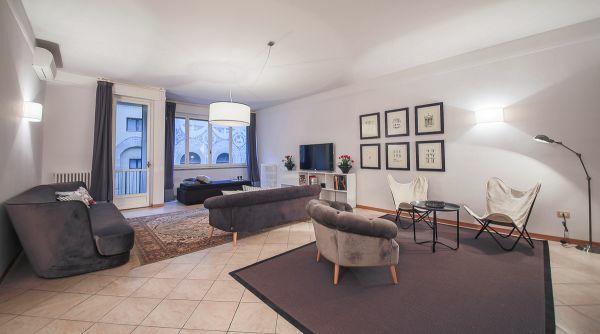 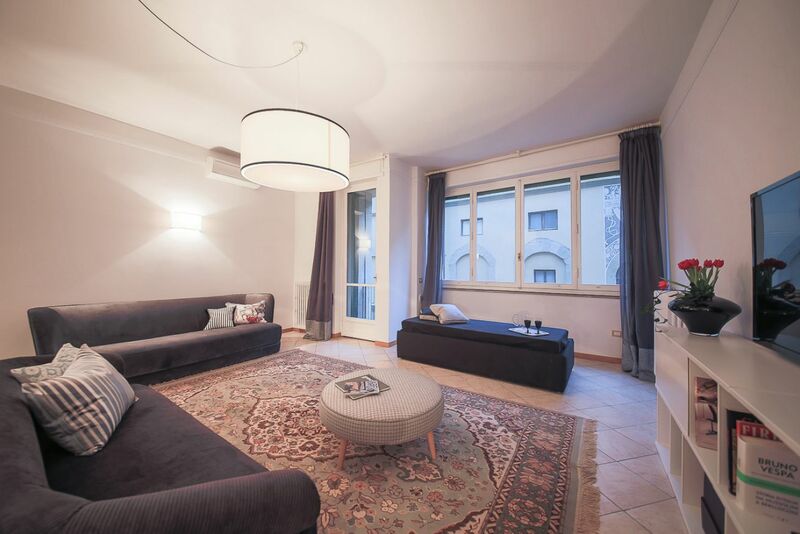 Elegant apartment in Florence near Ponte Vecchio. 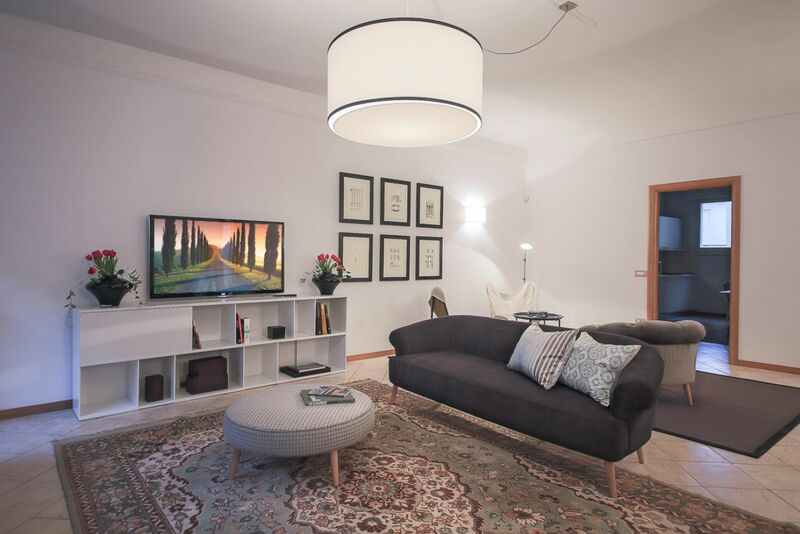 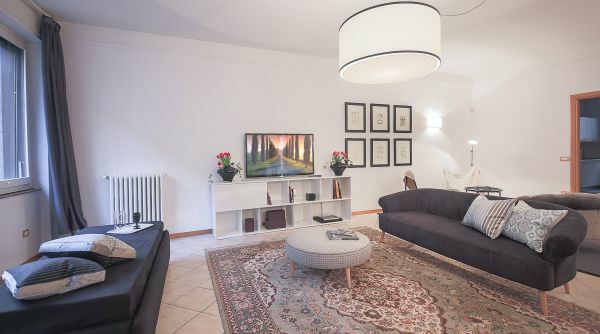 Summary This apartment's exceptional location, combined with its stunning interiors and features create the perfect picture for your holiday rental. 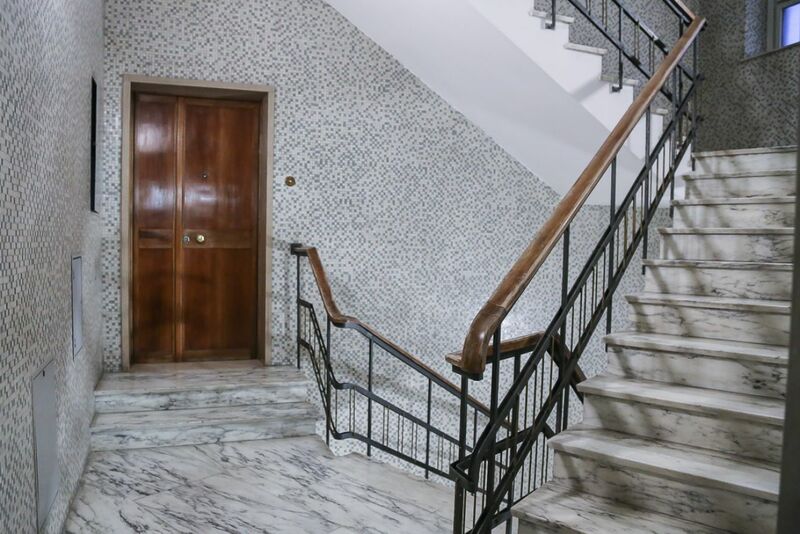 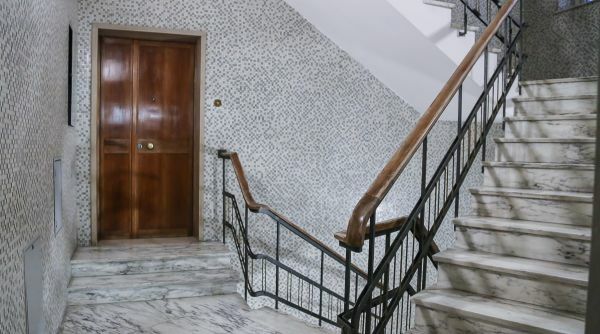 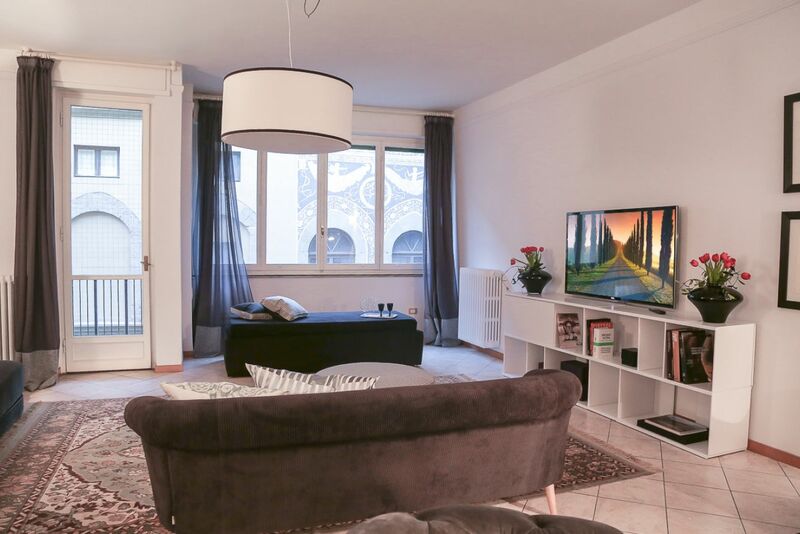 This marvellous apartment is located on the second floor – with elevator! 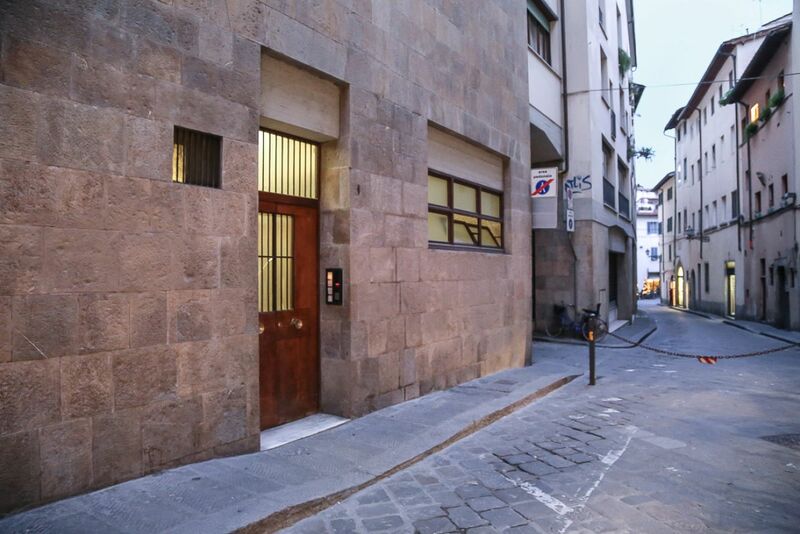 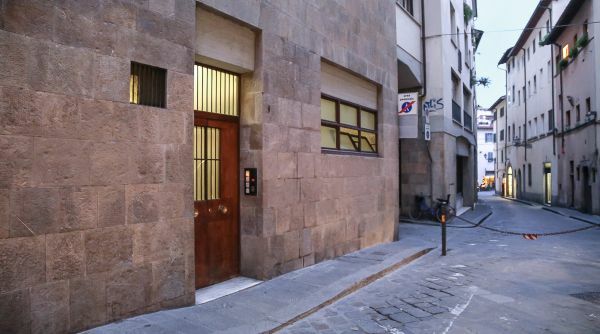 - of a modern building in Via dello Sprone, nice little street very close to Ponte Vecchio and Piazza Pitti, in the Oltrarno area. 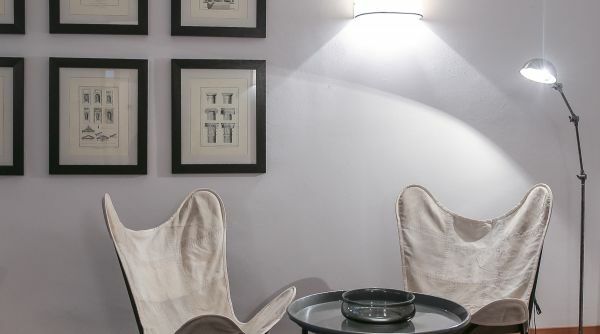 The whole place has just been renovated and redecorated with great taste and attention to detail, choosing a n elegant, contemporary feeling style and with a special eye for comfort and prime choice amenities. 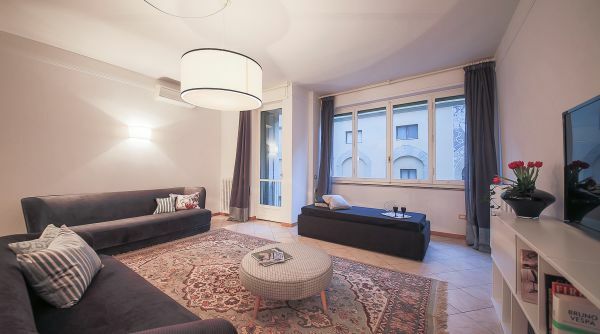 The spacious living area is bright and airy thanks to the large windows and to the high ceilings. 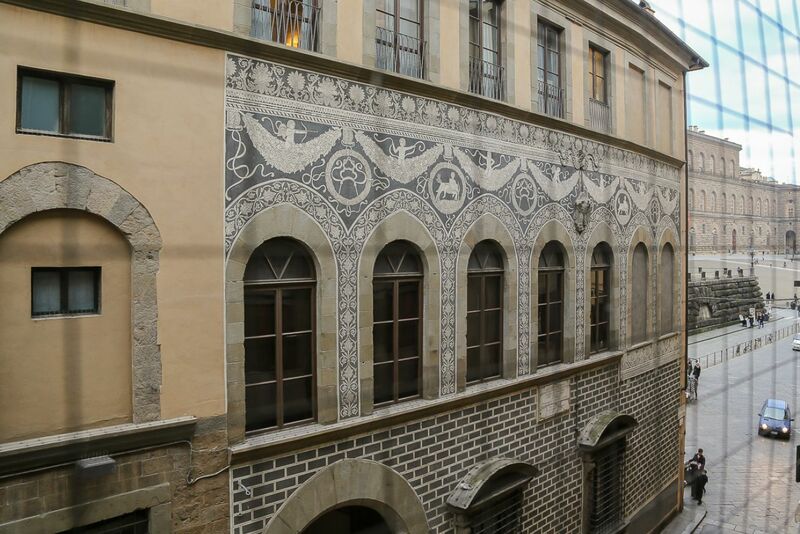 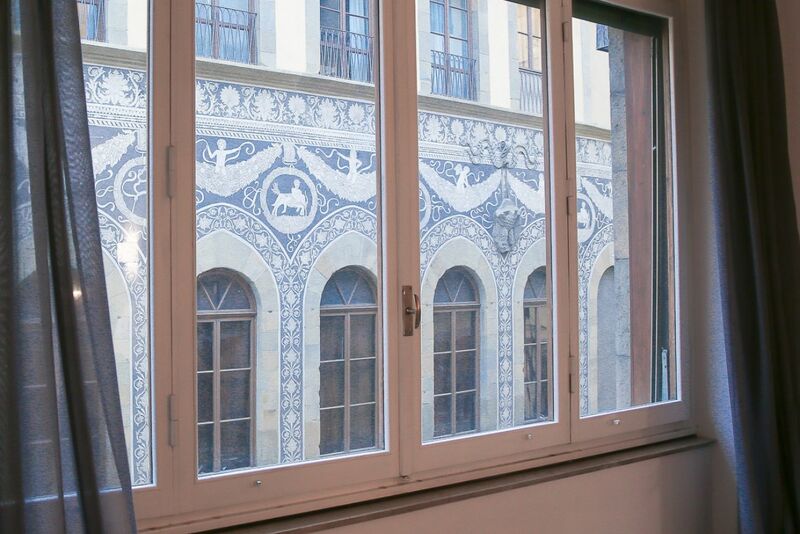 The windows face a marvelously decorated palace facade, and in the right corner you can see Piazza Pitti! 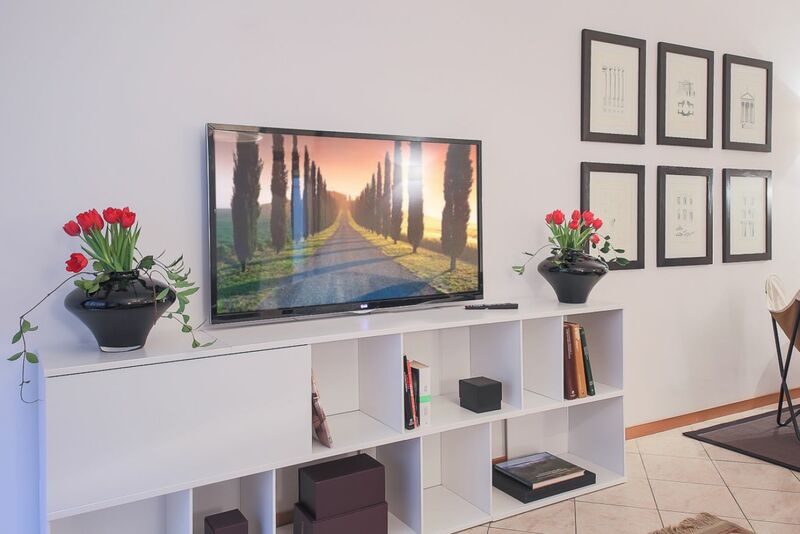 The living room is equipped with comfortable sofas (one sofa bed), armchairs, library and flat screen TV. 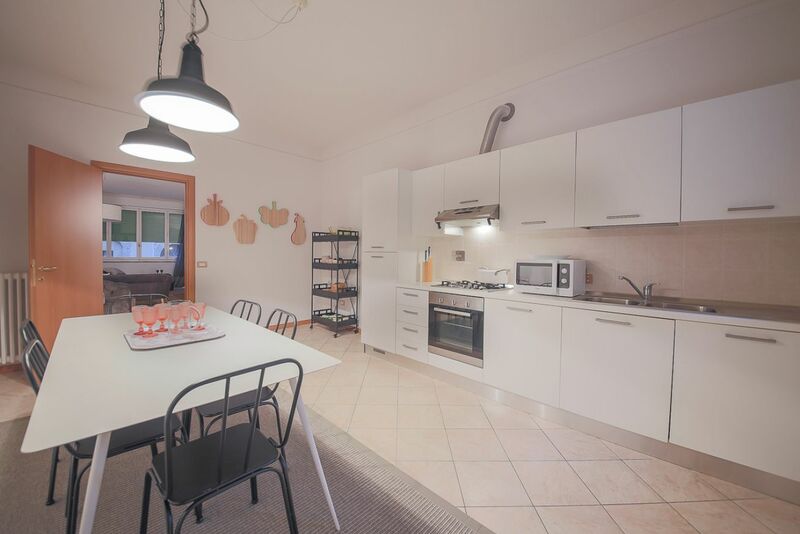 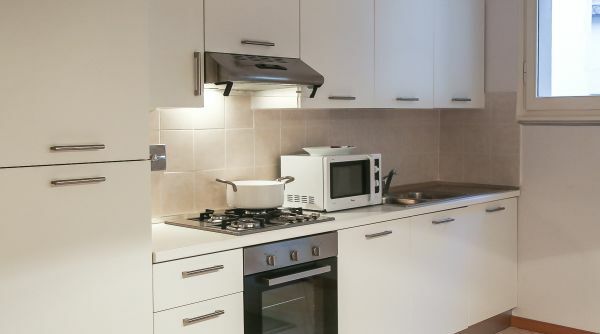 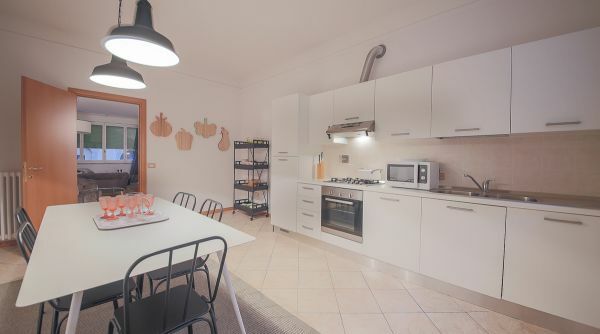 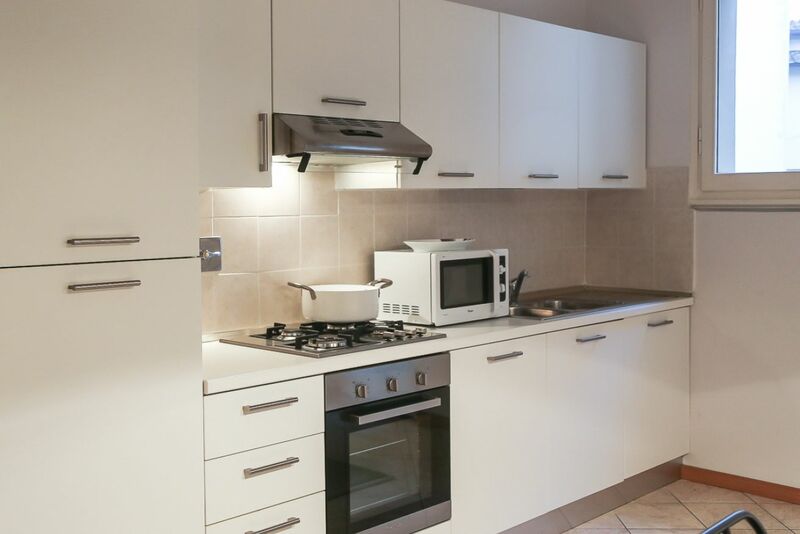 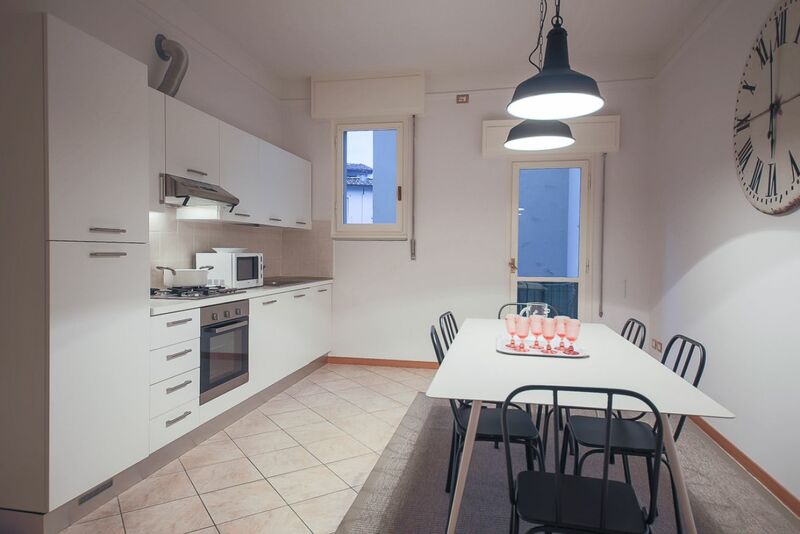 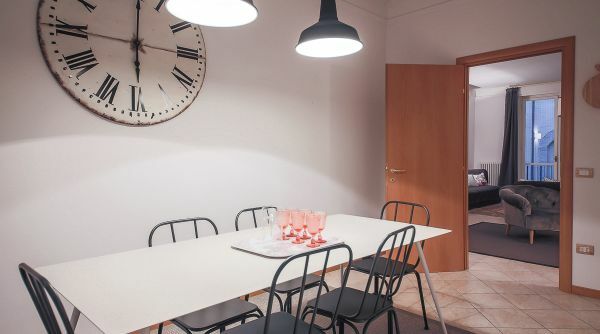 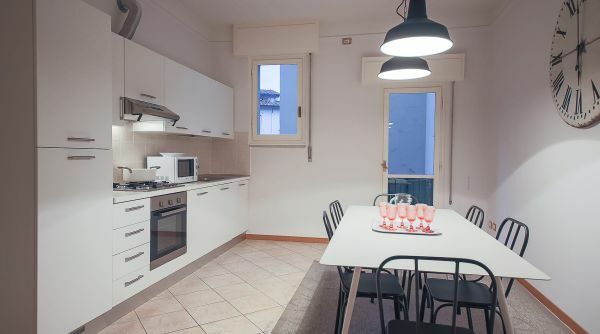 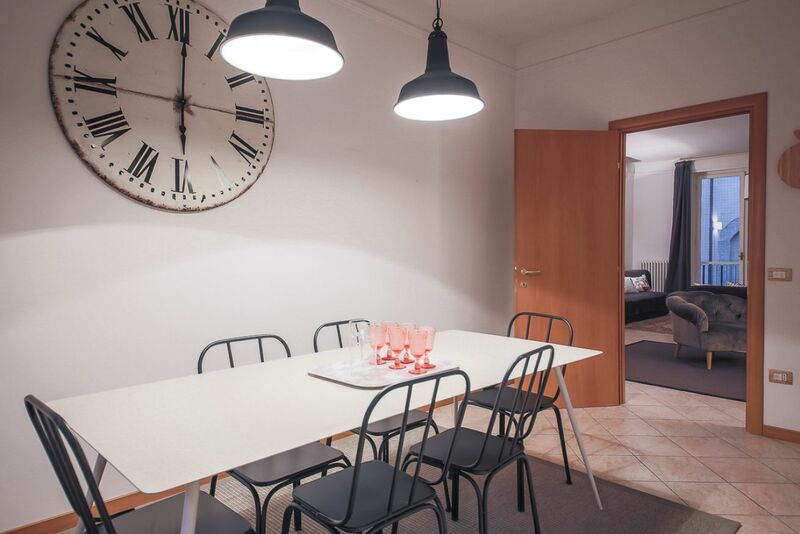 The kitchen, just off the living room, is spacious, modern and quiet, featuring a nice dining table for six and of course fully equipped with anything you may need to cook your own favourite meals while enjoying yourself in Florence. 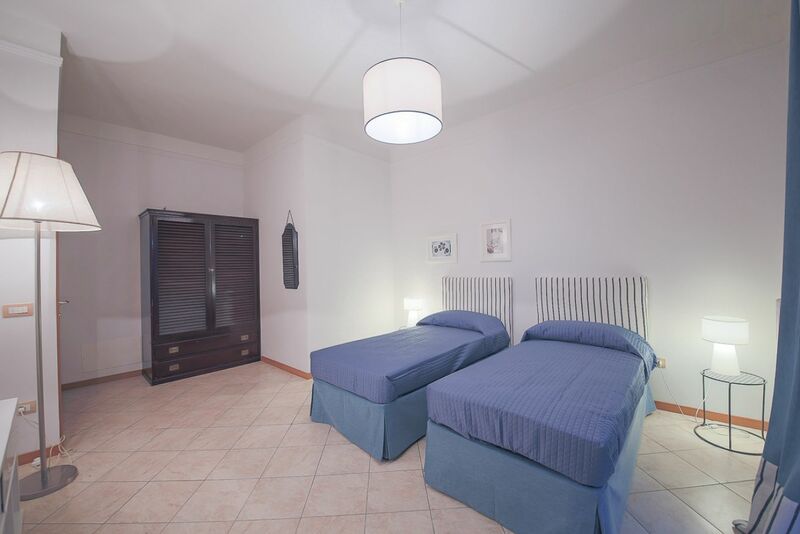 Six people con be accommodate in this apartment, thanks to the two bedrooms and the double sofa bed. 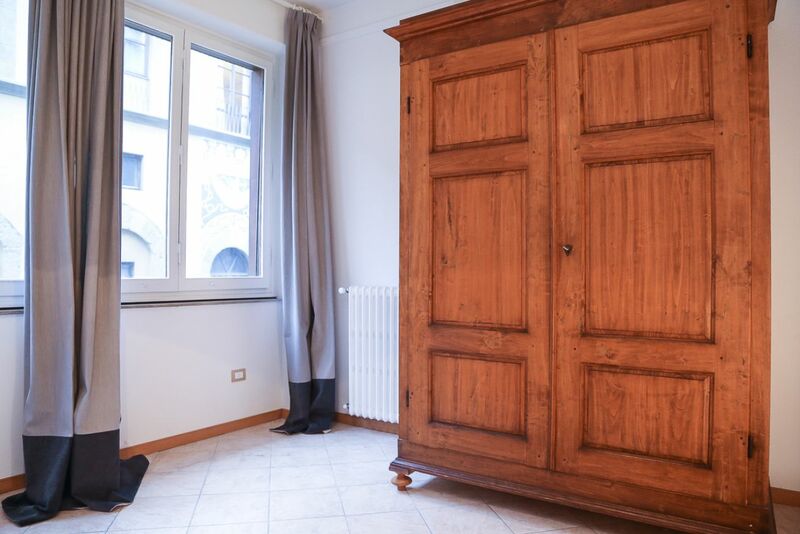 The master bedroom, spacious and filled with light thanks to the many windows, features a comfortable queen size bed, a marvelous wooden closet and night tables. 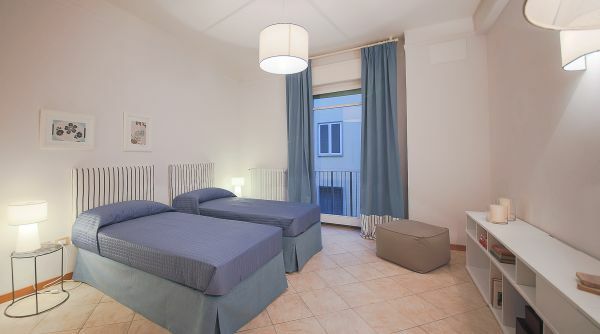 The second bedroom, also very spacious and bright, features a couple of single beds, library and closet. 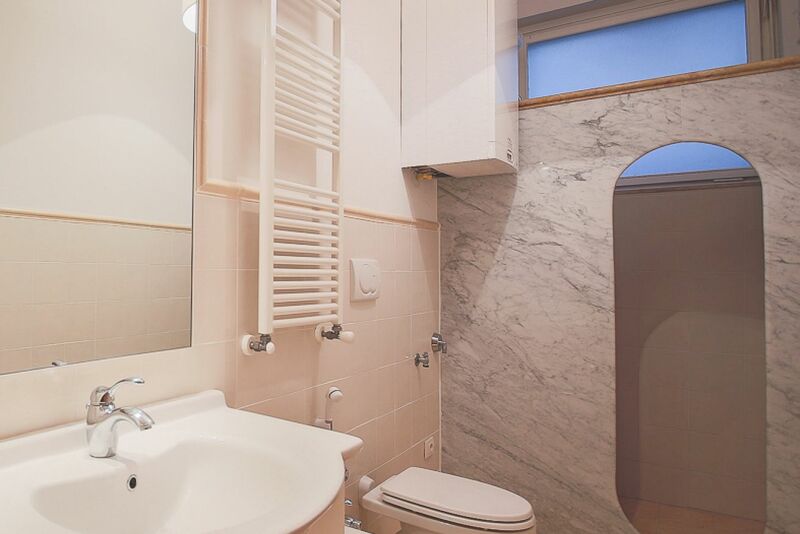 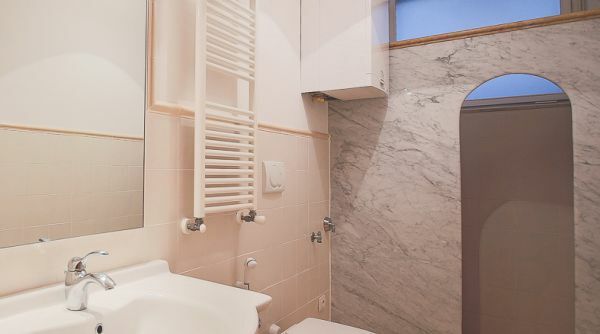 The recently renovated bathroom is very spacious and has refined fixtures such as the marble walk in shower. 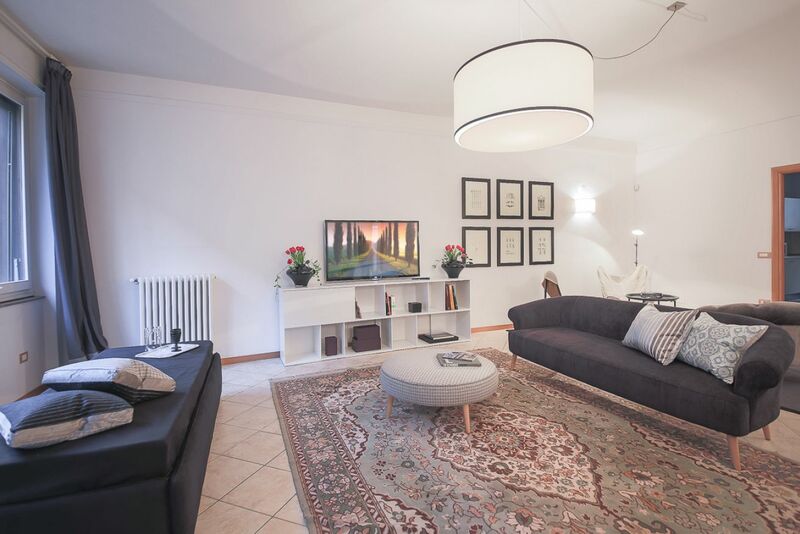 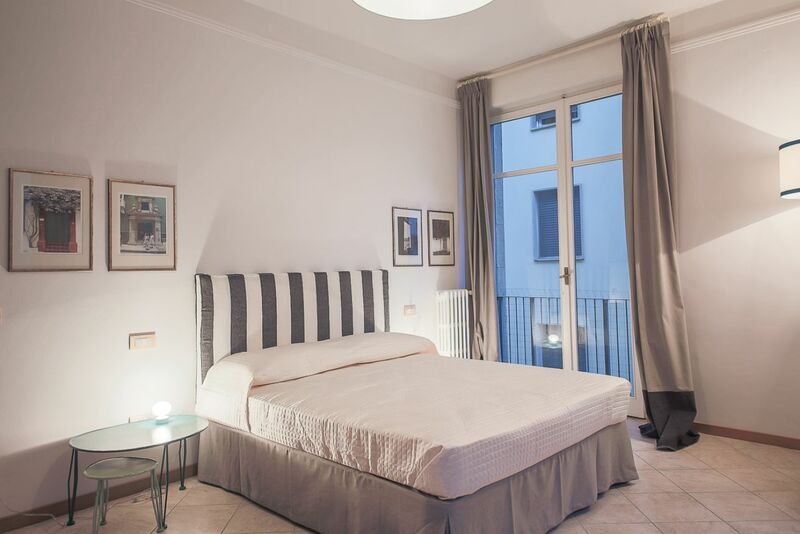 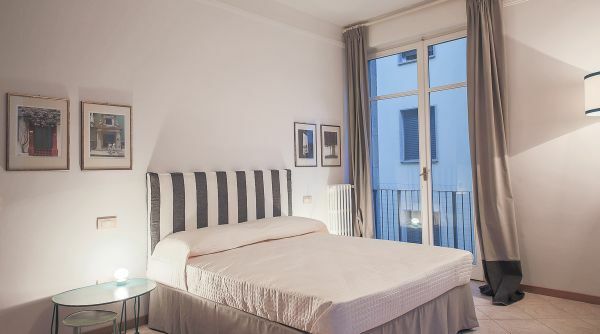 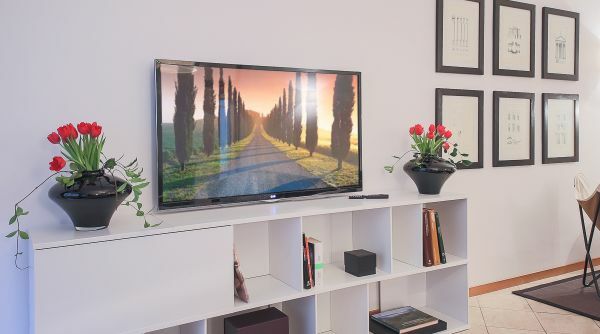 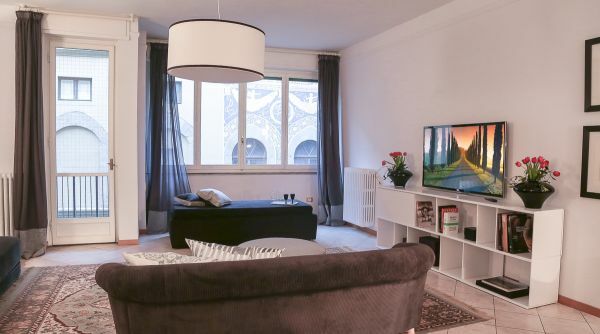 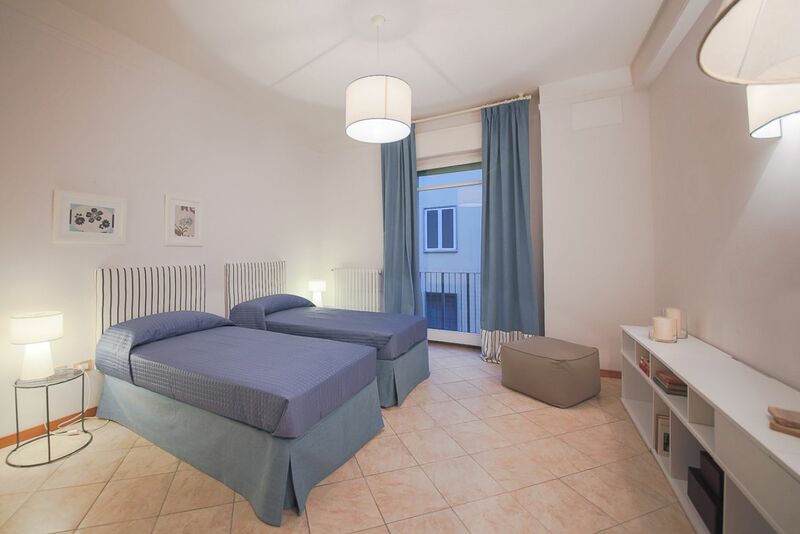 This wonderful apartment is the ideal choice for a family or a group of friends looking for a comfortable, stylish location for their holiday in Florence. 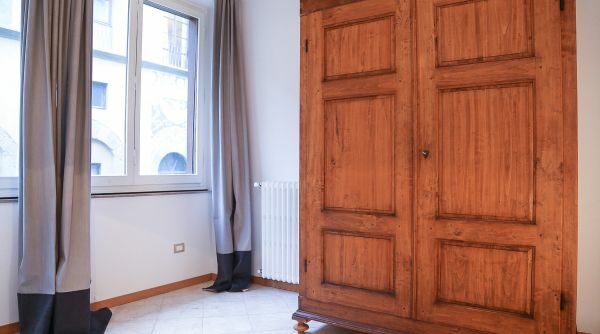 The apartment's exceptional location, combined with its stunning interiors and features create the perfect picture for your holiday rental: from here, you'll be able to explore all of Florence's beauties and attractions on foot, while also staying in a very typical and authentic neighbourhood, the Oltrarno. 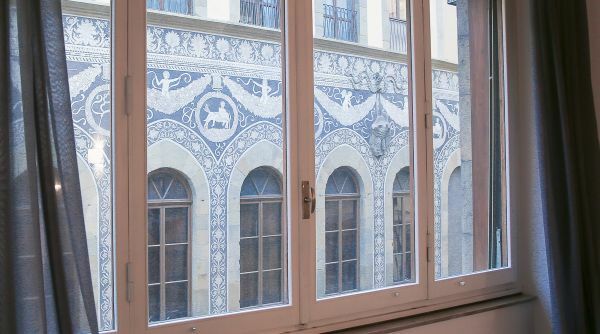 This area of Florence is filled with typical restaurants, trendy cafès, design shops, antiques shops, workshops and live music clubs: a very lively and eventful atmosphere awaits you! 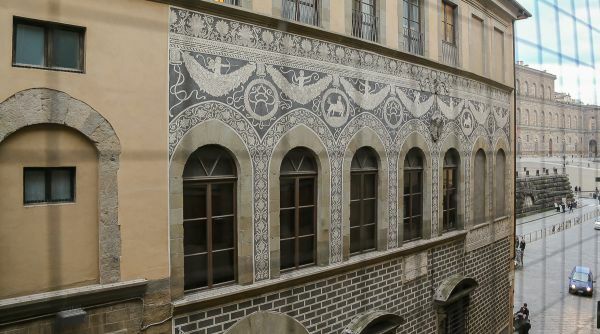 Also, all the historical landmarks and monuments are all just a short walk away: Ponte Vecchio and Piazza Pitti are just around the corner, while Santa Croce, Palazzo Vecchio, the Duomo, the Uffizi gallery are all just a short walk away!